capable of various games(compatible with: PLAYERUNKNOWN'S BATTLEGROUNDS, H1Z1, etc..). 2.All-inclusive protein leather earmuff can reduce hearing impairment with soft and delicate touch. delivers more accurate,clear and smooth voice. 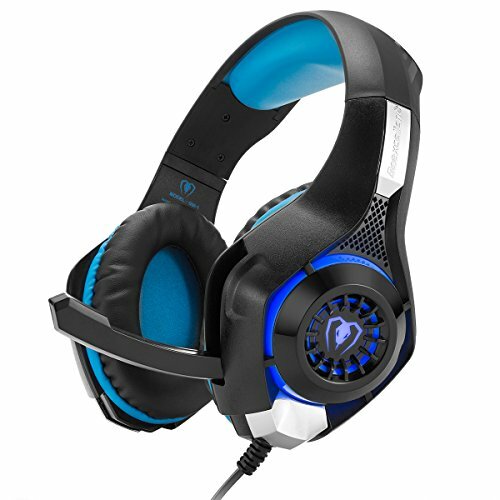 【Professional gaming】BEEXCELLENT GM-1 gaming headset is specially made for video gamer. The 3.5mm plug is widely compatiable with Playstation PS4, PSP, New Xbox One, iPhone 5/6, Samsung S5/S4, LG, Huawei Smart Phone, iPad, Android Tablet, etc. Color: Black Blue. 【Easy to use】This headphone is equipped with a volume controller & microphone mute button, which allows you to operate them more conveniently when it's needed. The both side LED lights make your gaming experience more cool! 【Bass enhanced & Noise Cancelling】 The built-in bass enhanced feature makes the game sound effect more vivid and shocking. It's just like you are in there! Noise reduction: High precision 40mm driver with immersive 360-degree stereo sound. Compatible with most games like: PLAYERUNKNOWN'S BATTLEGROUNDS, H1Z1, etc..
【Max comfortability】The GM-1 headset comes with super soft over-ear pads and the earmuffs are made of skin-friendly leather material that is more comfortable for long time wear. 【Universal compatibility】Compatible with any devices that have 3.5mm audio jack port, such as PS4, new Xbox One (Xbox One S)[Old version Xbox One requires an adapter which is not included in this product], PC, laptop, tablet, iPad, computer, smart phone. The package includes a FREE Y split adapter cable for traditional PC/Laptop 3.5mm Speaker & Microphone Jack. Note: 18 months warranty, free exchange or money back! The USB plug is only for powering the LED light. No need driver, Plug and play.